Just a reminder that the Stop & Shop Gift Card Catalina deal ends tomorrow, 6/23/11. So, if you still want to take advangtage of it or if you want to continue to take advantage of it, tomorrow is your last day. Buy $50 in select Gift Cards and get a $15 Stop & Shop Catalina. One of the number one ways to take advantage of this offer is to purchase $50 worth of gas cards since this is something that we will use anyway. And you get a Free $15 catalina for Stop & Shop. Reader Ueen had another suggestion on how to take advantage of this deal. 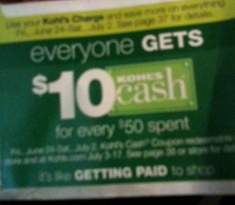 Buy a $50 Kohl’s gift card and then starting on Friday, 6/24 – 7/2, when you spend $50 at Kohl’s, you get $10 in Kohl’s Cash. It’s just another way to keep the deal rolling.